In 2016, Peter determines to transfer into a totally new life, as many people pursue. However, it is difficult for busy office worker as Peter to start a new lifestyle in the city full of traffic jam, polluted air and overtime work. Peter is so depressed faced with this situation. The friend of Peter suggests him to start from changing the way of traveling first. 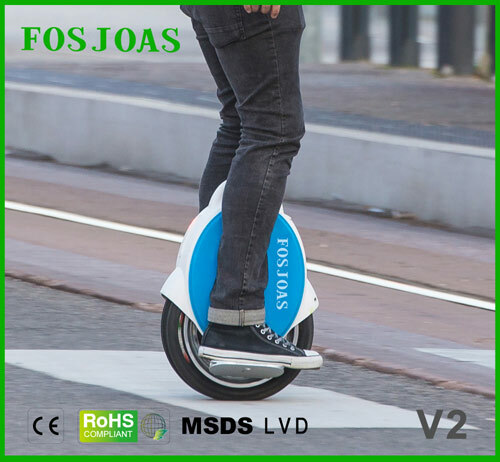 Fosjoas V2 electric unicycle, the green electric scooter seems to be a good choice since it can help customer to exercise and keep fit while reducing the pollution and improving the apportionment at the same time. Fosjoas V2 is equipped with the imported Li-ion battery which is of good quality and of long usage life. The battery can guarantee the quality in case of sudden exploration. Peter appreciates the Li-ion battery very much since the long time cursing power. He never worries about the lack of power on the half way. The battery also means no emission or pollution from the self-balancing electric scooter which is environmentally-friendly. Peter hopes to do from himself to change people's traveling into green one, which can also decrease the traffic jam. Peter benefits from Fosjoas V2 not only in protecting environment, but in exercising and keeping fit. He plans to exercise regularly, however, Peter loses enthusiasm after the long-time working. The two-wheeled electric scooter forces Peter to stand on the way to company which can consume the calories greatly. Peter has lost weight after riding Fosjoas V2 for a period, and he feels healthier. He decides to insist on riding the scooter to exercise every day. Peter has benefits from self-balancing electric scooter, and he changes his lifestyle into the greener and healthier one in the new year. He doesn't worries about being late or putting on weight any more. Under the leadership of Peter, his friends and colleagues follow him to start a new life.